A lot of companies still buy lists in the hope that a well-written e-mail blast will bring a return on that investment. No matter how you cut it, buying a list and sending a mass email is considered spam. If you absolutely must buy lists, especially if you use HubSpot, you need to read the rest of this article. The person you're emailing has never given you permission to market to them. You're interrupting them, hoping to spur enough interest for them to react in some way. The worst part of it is, if enough people on your list flag your unsolicited email as spam, you can lose your email privileges and have your account banned. A company with a frozen email account doesn't do inbound marketing very well, and it's a killer to the bottom line. I don't believe in buying lists. It's dangerous and they rarely bring a positive ROI while annoying thousands of people who didn't appreciate the spam. There's much better ways to do email marketing. Just don't ever do it. You never want to import your bought list into HubSpot. For one, it's against their acceptable use policy, and for two, you're asking for a spam backfire and losing your email marketing privileges, which is one of the more powerful features of HubSpot in the first place. Just don't do it. If you buy a list of 10,000 contacts, the chances are a very low percentage is going to respond. Even fewer will respond favorably. It's those few who respond favorably that you want in your HubSpot system anyway. They're the ones who have a chance to become a customer. Let's just make the decision to only allow opt-ins to live in our HubSpot account. For one, HubSpot limits your contact quantity depending on how much you pay a month. You don't want those precious slots taken up by people that aren't qualified to do business with you. You want to save them for people that care. Culling your list of the uninterested and unqualified isn't that difficult. So we'll look at the process you should go through to clean up your list, send them your email blast, and get them to add themselves to HubSpot. There are a lot of list cleaners, like Scrubbly, available. Some are better than others and you should do your homework to find the one that gives you the best price, and does the best job. You may even want to run your list through a scrubber multiple times to make sure all hard-bounces and bad e-mails are culled before you try sending them an email blast. This is Inbound Marketing 101: you can blast the list with your product offer, or you can blast them with valuable content for free. You will convert more with a free content offer than you will with a sales letter. In HubSpot, setup your offer with a Landing Page. This landing page needs the form with first name, last name, and e-mail address. You can put more if you like, but with each additional form field, your conversion rate will decrease. On your Thank You Page, offer them a secondary offer to keep them on your website longer. Use a Smart Form to gather even more information from them. This step gives the list members a chance to opt themselves in to your HubSpot system. Step 3: Create a Smart List for that form on that page. You'll want a way to cull the opt-ins from your bought list. If you send another email to engage the list members, you don't want the contacts that already converted to get those emails. Creating a smart-list will give you an export you can then upload to your 3rd party email service as a suppression list. There are a lot of these out there; some even give you a free account with up to 2,000 contacts. So you may not even need to invest any money into this step. It's into this service you will import your contacts from the bought list. Note, you may want to break up the list into smaller segments. Some email marketing providers will flag your account if you import a large list, and will shut you down before you even get a chance to email your list. Break your bought list into chunks of 1,000-2,000 contacts. Then, you'll want to send them an email with one, single offer, which sends them to the landing page. Those who click through and convert are now opted into your HubSpot system, and your email privileges are safe. If for some reason you get too many spam complaints and your 3rd party provider freezes your account, you can always move on to another provider. But you won't be putting your HubSpot system in jeopardy. As I said before, bought lists are still one of those relics from an old way of doing business. Companies, especially with large sales departments, will be buying lists for many years to come. If you can talk them into investing that money elsewhere, like into Social Ads, you'll probably get more results and a higher ROI. However, if you're forced to work with bought lists, don't put your HubSpot in danger. 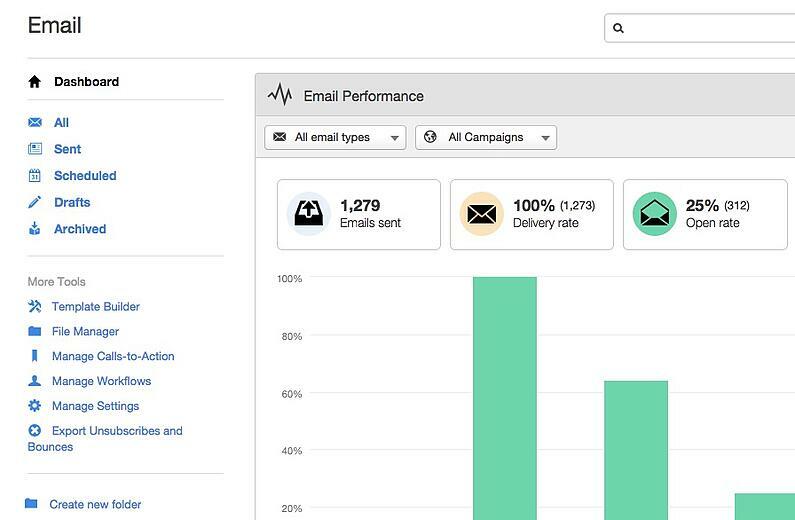 Use a 3rd party email tool to buffer the spam complaints and keep your HubSpot contact list squeaky clean.